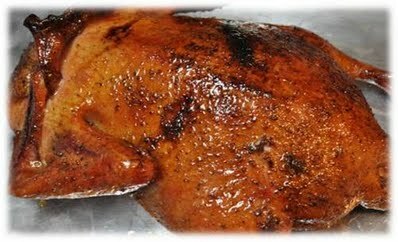 Many people are fans of smoked duck because it has a bolder flavor than other poultry like chicken. Duck is made with all dark meat and has heavier bones than other birds. Keep this in mind if you are used to cooking enough food for your guests based off the weight of the bird. Duck is also known for having more fat than other types of poultry, especially for a game bird. This fat content helps retain the moisture by basting the meat while smoking the duck. This smoked duck recipe will provide you with a crispy skin and meat that is so moist that practically falls off the bone. See the recipe ingredients, smoking time and step by step instructions below for tips on how to make this recipe. Begin this recipe by lighting your smoker for indirect grilling and soaking your wood chips in water. Use a fork to poke holes in the skin of the duck so your seasoning can go past the fat and into the meat of the duck. Season the duck with the black pepper, garlic salt, soy sauce, honey and red wine inside and out. You can reserve some additional liquid ingredients to use for basting later during the smoking process. Basting the duck will add additional moisture during the low and slow cooking it takes to smoke the duck. Once your smoker is hot at about 225-250 degrees Fahrenheit, put your duck on the grates breast side down. This will ensure the fat in the back side of the bird will melt down into the meat and give you a tender smoked duck. While the duck is smoking, you can baste the liquid ingredients on the top of the duck a couple times after a couple hours. You can either use a basting brush or simply spoon the ingredients on the top and let them trickle down the meat. The entire smoking time on the duck will take about 4 hours depending on your temperature of your smoker. Cook the duck until the internal breast temperature reaches 165 degrees. Smoked duck will take you about 4 hours depending on your smoker temperature, the type of smoker you are using, and the actual weight of your duck. If the internal temperature won't easily reach 165 degrees, you can always tent aluminum foil over the top of the duck for the last 30 minutes to help increase the heat in your smoker and speed up the cooking process.